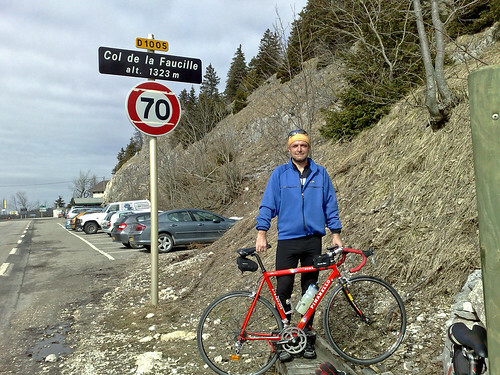 Col de la Faucille is one of the best know climbs in the Jura Mountains. It has appeared 10 times in the Tour de France since 1951. Last appearing in Stage 18 in 2004, I watched this stage live. This was the day Armstrong – despite already clinching the Tour – chased down an escape as it contained Filippo Simeoni. Simeoni had testified in a doping probe and tried to implicate Armstrong. Armstrong had called him a compulsive liar. So – although Simeoni was no threat to the general classification – Armstrong decided to chase him down. As the peleton passed us, we were shocked to see the yellow jersey leading a stretched pack of riders as they approached Faucille. Simeoni’s break-away of course came to nothing. 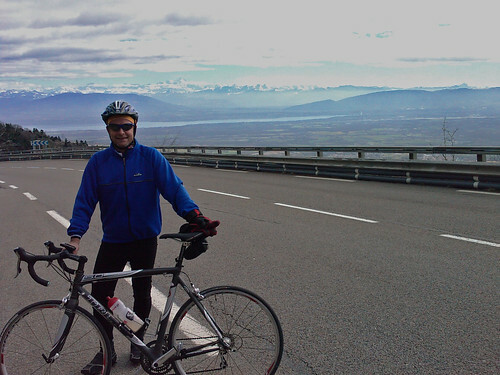 It’s not the hardest climb, but leads to views of the Alps and Lake Geneva below. Martin and I started in downtown Geneva (in total 63 kms, just under 1000 metres vertical). But the climb really starts in Gex. It’s a popular route for cyclists and we saw several, but the route has a fair amount of traffic. A Sunday in March is probably as quiet as it gets – avoid on weekdays as Trucks use this route as a short-cut to Dijon. In the summer there are many better ways to climb this area of the Juras. Nearby are superb, deserted forest roads up to La Baudichonne, La Vattay and La Barillette. But they are not cleared in winter. I agree with you, this road is very busy. But the other side from St Claude it’s a very nice climb, quieter. If you climb on this side, Col de la Faucille is an interesting climb. And from the Col de la Faucille, you should try the Col de Crozet with your mountain bike. Do you start in Crozet, or on the other side? The Col de Crozet is a mountain pass between Crozet and Lélex (1429m). You have to use your mountain bike. I think the way from La Faucille to the Col de Crozet via “la Marechaude” is easily passable. From Crozet, maybe it’s also possible. I see two bikes there in the pictures. How many do you have? For infos (but maybe you know), it’s possible to climb with a bike Petit Mt Rond (1534m) from Col de la Faucille. The road is in poor conditions (but paved), you have to walk a little (about 50 meters + 20 meters if you don’t have a mountain bike) but it’s interesting… with a loop as Col de Puthod, Faucille, Mt Rond for example to avoid traffic. Other possibility: you climb Col de Puthod and you go towards Les Rousses, Les Jouvencelles (D29E…), you climb a “new” col (1374m) in Forêt du Massacre (East of Crêt Pela) by a little road. You can carry on the road wich goes to Lajoux and come back by Col de la Faucille. 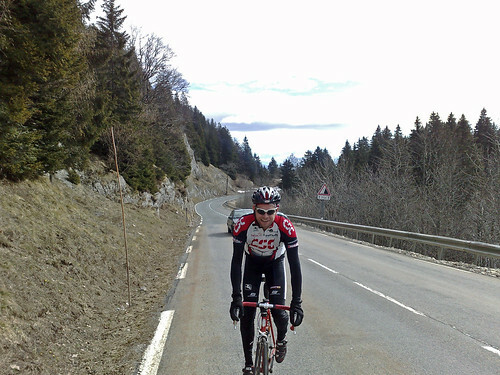 About Col de Crozet (1450m), you should try too. It’s written “cyclable” (you can ride this pass without walking). The way: Faucille, La Maréchaude, Col de Crozet. If I were you I would take a mountain bike because the end of the road isn’t paved. Lastly, you can ride Creux de l’Envers (south of Col de la Faucille) by Gex for example (route du Creux de l’Envers, about 1000m). There is also an other road wich seems interesting, you start in Gex also, route du Creux de l’Envers, to 850m you take on your right a road (the western side) that is steep and straight. That road is probably not paved but in good conditions. From Petit Mt Rond, you see well that way leading maybe to Pas de l’Echine (1300m). If it’s possible with a bike, I think the summit is great. Firstly, thanks very much for the great website – I found it accidentally just after moving to Geneve a couple of months ago, and it is really inspiring! So far I’ve climbed the Saleve, and this morning went up the Col de la Faucille (had to really, as I live on the Rue which is named after it 🙂 )and had a fantastic ride. It was a bit hazy looking back to Geneve from the top, but could still make out the Jet d’Eau! I did have one question – I’ve seen mention of the Col de Puthod twice on your website, but I can’t find it on my map. Any chance you could let me know where exactly it is (near/above which village etc), and is it paved all the way, as I don’t have a VTT? Well done climbing Col de la Faucille! Trust me, while it is a very good climb, there are dozens better in the Juras – Faucille has a bit of traffic – whereas many Jura roads are virtually car-free. For a fantastic and challenging road bike climb just to the east – try La Dole / Barillete. Very quiet incredible climb – far better than faucille – steeper and higher too. I did La Dôle and La Barrilete today thanks to your recommendation above. My second ride in the Geneva area and it was fantastic. Thanks a lot for this great website. Col de la Faucille is open all year …. open now. Enjoy.